Synchronize Microsoft Outlook PST files. Sync Outlook folders between multiple PCs without a server using an external USB device or shared network folder (LAN), and a shared PST file. Sync2PST is a downloadable PC application that allows you to synchronize Microsoft® Outlook® PST files (stores all the Outlook settings and data). Synchronizing automatically or manually any of your Outlook folders between two or more computers (Desktop PC and Laptop) has never been easier. Outlook sync can be made via shared PST files located on the same PC, your network, USB flash or hard drives. In just a few clicks, you can sync important Outlook e-mails, tasks, journal entries, contacts, and calendar appointments, instead of copying all the data between computers. Sync2PST has been designed primarily as a personal synchronization tool, but you can also use this tool for synchronizing or sharing selected Outlook folders with your family, friends and co-workers. 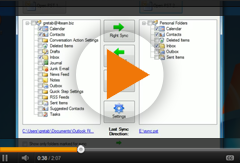 Synchronize Microsoft Outlook on multiple PCs (e.g. : Desktop and Laptop) via a shared PST file or sync your machines directly. Scheduled Automatic background or Manual Outlook PST file synchronization, even if Outlook is not running. One or Two-way PST file synchronization. Synchronize contacts, mails, notes, appointments, tasks, journal entries, distribution lists. Share your Outlook e-mail, contacts and calendar folders or sync with your colleagues. Sync .PST files on a network (LAN). Synchronize and share Microsoft Outlook data via shared .pst file on the local network. Sync2PST prompts for a password to PST file before starting synchronization. The password can be saved by application and used automatically during synchronization. Synchronize all Outlook items fields including flags and "Read/Unread Status". Supports deletions. Preview and compare the contents of your PST files from one window without exporting or importing PST files to Outlook. Use Sync2PST for export-import of specific Outlook folders data. Synchronize your whole Outlook PST file or only selected folders. The state-of-the-art Outlook file synchronization software tool that works directly with MAPI without interference with your Outlook. There are no add-on/plug-in to install. The 4Team Sync2PST add-in for Microsoft Outlook supports the latest Outlook and Windows versions (Windows 7). Use your PC, any networked device, or removable memory device (Memory Sticks, USB Flash or HD Drives, etc.) as a shared folder location for your shared PST file. The ability to quickly exclude/include/lock data range by category, privacy and time range to only what you want. Duplicate Killer for Microsoft Outlook Find, merge or remove duplicates in Microsoft Outlook folders, including Public Folders automatically.